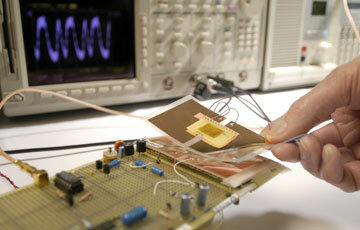 Scientists at Philips Research have created a fully functional 13.56 MHz RFID tag based entirely on plastic electronics. 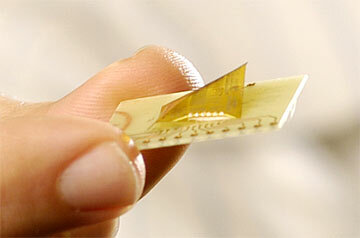 In contrast to conventional silicon-chip-based RFID tags, a plastic electronics RFID chip can be printed directly onto a plastic substrate along with an antenna without involving complex assembly steps. This could pave the way for the packaging industry to replace existing barcodes by a low-cost RFID tag that provides individual packages with a unique item-level identification code – something not feasible with current barcode technology. Radio Frequency Identification (RFID) is an automatic identification method, based on remotely retrieving information via radio waves from miniature electronic circuits called RFID tags. Philips has now realized the first plastic-electronics-based tag that is capable of transmitting multi-bit digital identification codes at 13.56 MHz – the dominant industry-standard radio frequency for RFID tag applications. As an additional demonstrator for the technology, scientists at Philips Research have also developed a 64-bit code generator, showing the practicality of building plastic electronic circuits with the complexity required for item-level tagging. Performance results for these circuits will be presented at this year’s International Solid-State Circuits Conference (ISSCC, February 5-9, San Francisco, CA, USA) in a paper that will also be awarded the conference’s Beatrice Winner Award for Editorial Excellence. Being a world leader in the RFID business, Philips supplies silicon-based components for applications such as supply chain management, public transport, pharmaceuticals and animal tracking. Current silicon-based tags have excellent performance, and when produced in volume, can be manufactured at low cost. Philips is also conducting research into plastic-electronics-based RFID tags, since these tags have the potential to be manufactured in a radically different way, namely via even lower-cost reel-to-reel and other in-line processing techniques. Philips Research has more than ten years of experience in the field of organic electronics, which has resulted in many scientific publications and patents. Next to the rollable displays of Philips Polymer Vision and recently demonstrated polymer memories, RFID tags are the third application area for organic electronics being developed by Philips. The plastic RFID tag results being presented at this year’s ISSCC are derived partly from Philips participation in the PoliTag project, which is funded by the German Federal Ministry of Education and Research (BMBF), and partly from Philips participation in the 6th European Framework Programme project PolyApply.